Transforming Growth Organizations into High Velocity Innovation Heroes! 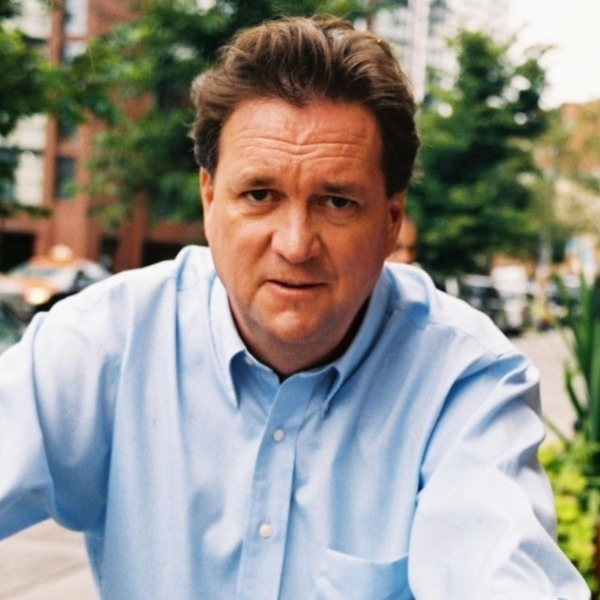 Jim Carroll is one of the world's leading international futurists, trends and innovation experts, providing strategic guidance and insight to some of the most prestigious organizations in the world for over twenty years. He is recognized worldwide as a "thought leader" and authority on: global trends; rapid business model change; business transformation in a period of economic uncertainty; and the necessity for fast paced innovation. His client list is unique, to say the least. NASA has had Jim Carroll in (twice!) to help shape their thought process about the future, with audiences featuring astronauts, astrophysicists, launch directors and mission controllers. The global master of story-telling, the Walt Disney Corporation, made the observation after a leadership presentation that "Jim's storytelling approach really helps to get his points across!" The GAP, one of the worlds' leading retailers, brought Jim into their global head office for a talk on the future of retail! He has a track record of inspiring organizations to reframe the opportunity for innovation in the context of significant, transformative change, including the world's largest working sports organization. The PGA -- Professional Golf Association of America -- selected Jim Carroll to open their 94th Annual General Meeting for his message on future trends and innovation, the first time in their history that they have ever featured an external speaker for their AGM. Subsequent to his keynote, the President of the PGA had this to say: "Futurist Jim Carroll helped stimulate the thought process with his keynote address about the incredible rate of change that we as a society find ourselves in, and I was delighted with the lively discussion in the hallways, the passionate positions taken at the microphones …." 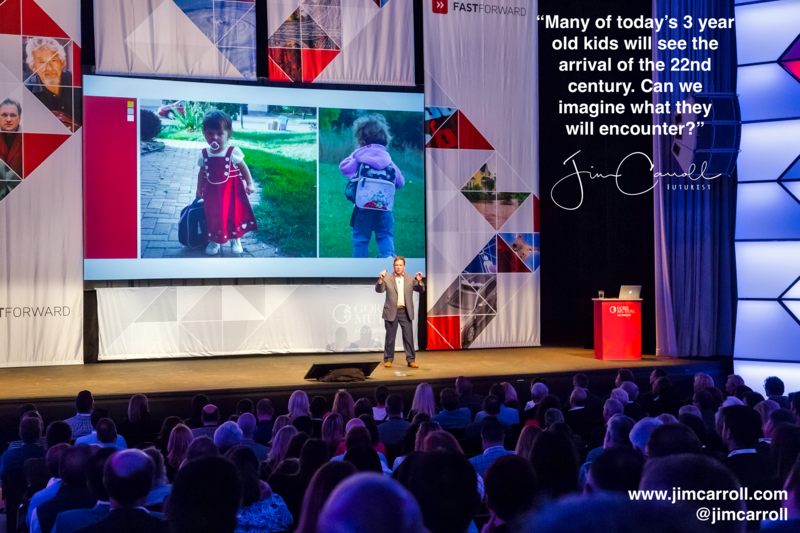 If Jim Carroll can challenge Disney, The GAP, NASA and the PGA to think passionately about linking future trends to innovation – he can do the same for you! Jim's insight is sought internationally. He was one of two speakers to address fifty senior CEO, CFO and CIO level executives in St. Andrews, Scotland, at an invitation-only corporate event – the other speaker being Jimmy Wales, the Founder of Wikipedia. He was the opening keynote speaker at the World Pharma Innovation Congress in London, England, with a message focusing on the future of science and healthcare He has previously keynoted other events such as the Linde Healthcare Summit in Munich, Germany, the Swiss Innovation Forum in Zurich, the Toshiba Mobility Exchange in Sydney, Australia, the annual Business Outlook Forum in the Cayman Islands for hundreds of senior financial executives, and the SAP Business Forum in Stockholm, Sweden. Jim's client and event list is a veritable who's who of global leaders — including The GAP • Lockheed Martin • Fairmont/Raffles Hotels International • Accenture Worldwide Energy & Utilities Conference • HJ Heinz • RGA Reinsurance • National Australian Bank • Dupont • Discover Financial Services • Pfizer • PPG • Johnson & Johnson • Blue Cross Blue Shield • General Dynamics / Northrop Grumman • Bombardier • Signature Travel • Microsoft • US National Recreation and Parks Association • Burger King • US Department of Defense – Commissary Agency • Rockwell Collins; Oracle • International Association of Conference Centres • Pearson Learning • US Air Force Research Laboratory • McKesson • Siemens • US Navy, Marine, Air Force Child Youth Programs Annual Conference • Nestle; KPMG • World Congress on Healthcare Innovation & Technology • Yum! Brands (KFC, Taco Bell, Pizza Hut) • Towers Perrin • British Broadcasting Corporation (BBC) • Property & Casualty Insurance Association of America • World Congress on Quality • SAP • American Community Bankers Association • Providence Health Plans • Fidelity Bank (Cayman) Ltd • Verizon • Sporting Goods Manufacturers Association • American Express • Taiwan Semiconductor Manufacturing….all of these organizations have engaged Jim Carroll for a keynote or leadership meeting which focused on future trends, innovation and growth! There are hundreds more. The world's largest organizations turn to Jim Carroll when seeking insight into the future. Shouldn't you? Jim has researched key innovation success factors for dozens of industries, associations, professions, companies and individuals. Hundreds of thousands have shared his insight with highly energized presentations in Zurich, Munich, Palm Springs, Sydney, Cayman Islands, Los Angeles, Miami, Costa Rica, London, Nassau, Munich, New York, Vancouver, Stockholm, Budapest; everything from small Board-level sessions with 12 people; to high level CEO leadership meetings to 5,000 person conference keynotes. Jim is globally recognized for his unique wisdom and insight into trends. BusinessWeek commented on Jim: "a leading source for innovation insight;" he has been a CNBC guest expert on innovation; his insights have also been covered by ABC News, INC, Fast Company, the South China Morning Post (Hong Kong), American Way, The Age (Sydney, Australia), CAPITAL Magazine (Dubai/United Arab Emirates) CEO Magazine Hungary, Association LEADERSHIP, the National Post and PROFIT. Jim is also an author, with books including The Future Belongs to Those Who Are Fast,; Ready, Set, Done: How to Innovate When Faster is the New Fast; and What I Learned From Frogs in Texas: Saving Your Skin with Forward Thinking Innovation. Jim brings deep, strategic insight to his presentations. He is a graduate of the University of Toronto – Rotman Business School Directors Education Program, as his career path increasingly comes to include strategic guidance at the Corporate Board level. he provides unique, detailed, customized insight into workplace, business, economic, current events, social and cultural trends, as well as into demographic, lifestyle and technology issues, based on highly original research. he wakes people up to the trends that will affect them, and challenges them to cope with a world that continues to witness constant, dramatic change. "thought provoking, full of energy, up to the minute and timely" are just a few of the ways to describe Jim's presentations. Jim has the ability to energize people so they can discover opportunities for personal and corporate growth. each presentation is unique and customized. Clients value the time Jim takes to "know" their industry or profession, their issues and concerns. Potential topics - Jim will work with you to customize! What Do World Class Innovators Do That Others Don't Do? What's Happening with Your Workforce: Making Generations Work! Jim works with you and undertakes detailed research to prepare a customized presentation that meets your needs. He does what you need him to do: he addresses your issues, goals and opportunities, in the framework of his expertise as a global trends, innovation and change expert. "Jim is one of the best speakers we had. He had excellent information that our attendees could take home and incorporate it into their plans immediately. He also incorporated our messages into his presentation that helped localize the information for our group. Highly recommended!" - Illinois Bureau of Tourism. "Energetic, refreshing, meaningful ... you definitively set the stage for the next day." - Roche Diagnostics .